Compugeeks ShareSync delivers an easy-to-use, business-grade file sync and share service to small and medium-sized businesses via the cloud. ShareSync can help improve productivity for mobile employees and remote users, it helps boost collaboration, while offering full control and protection of company data. Files are automatically synced across all devices. You can sync files across desktop, mobile devices (iPhone, iPad, Android, Windows Phone, and BlackBerry) and the web. Support for Windows with familiar drag-and-drop functionality, and your files and folders are available from a web browser. You can share files with anyone via web link. Files can be viewed even if the recipient doesn’t use ShareSync. You can send a file using the Send Link function from the ShareSync web portal, or by copy/pasting the link into an email. Links are secure, but can be further protected with a password. 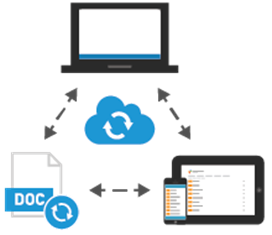 ShareSync allows you to sync files right from Office programs. Save files to ShareSync directly from the ribbon on Word, Excel, and PowerPoint. Furthermore, you can lock shared files to prevent conflicts , and restore previous versions. ShareSync offers full control and protection of company data. Sharing permissions are easy to set and manage at any time and ShareSync integrates with Exchange, Outlook, Office, and Active Directory. Compugeeks Backup seamlessly integrates with Windows and applications to provide you the flexibility to backup as little as one file, a specific application (such as Exchange and SQL), an entire Windows server, VMware or Hyper-V images and data, or anything in between. We ensure the smallest, fastest, most intelligent backups possible by using Deep De-duplication, Altered Data Tracking and WAN Optimization technologies. Backups complete as quickly as possible - without impacting your internet connection or your business. Compugeeks Backup uses only data center facilities that meet the rigorous standards and compliance needs of global businesses - meaning data is stored in state-of-the-art, secure and network-rich, ultra-reliable and energy-efficient centers with simply the highest standards of infrastructure design. We wouldn't settle on anything less - and we don't expect you to either. That's why you can rest easy knowing that the backup and recovery services you are receiving provide 99.999% availability. Need to be HIPAA Compliant? Click here: Is ShareSync HIPPA Compliant?